In order to discuss Army of Two The Devil’s Cartel in great detail, we must first discuss Applebee’s. Bet you didn’t see that coming. Electronic Arts’ third-person shooting game, which lets two players don hockey masks painted like panda bears before murdering hundreds of Mexican drug traffickers together, shares more in common with the chain restaurant known for mediocre steaks than you might expect. Both serve piles of greasy empty calories that, given no other options, can satisfy a particular hunger. Think about it like this: If you’re driving through Nebraska, hungry but not dying, and you don’t know where a good restaurant is, an Applebee’s may look appealing. “Oh, it’s Applebee’s,” you think, “Whatever. I could eat a burger covered with cold onion rings.” Burgers are plentiful after all; Applebee’s burger just happens to be there. 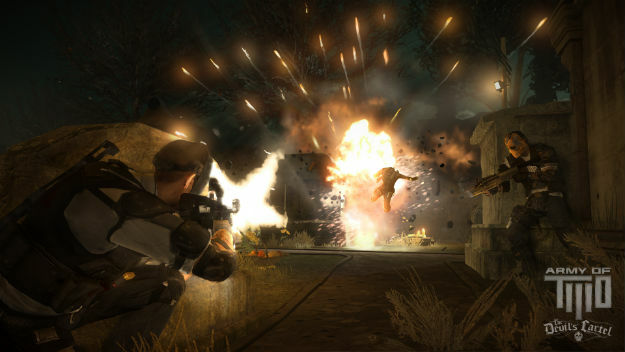 Games about shooting things are also plentiful, but if you happen to be in the proximity of Army of Two, you could do worse. Whatever. It’s right there. Mechanically speaking, a new demo of The Devil’s Cartel shown at EA’s recent event was virtually identical to the demo shown back in October. You play as one of two mercenaries wandering through Mexico fighting a drug lord and his minions using a seemingly bottomless pool of customizable guns. By shooting people in the game, you fill up a meter on the side of the screen, which can trigger Overkill mode, a slow motion mode that leaves you impervious, gives you unlimited ammunition, and lets you blow away large chunks of the environment. In this new demo, those blow-up-able objects were graves littering a cemetery. The sample on display, which stretched across four five-minute chapters from the middle of the game, was failry challenging. As in most third-person shooters, you’re stuck in small arenas for the duration of a shootout; a gated section of the cemetery, a bisected row of mausoleums, etc. Each one gives a nominal change in the conditions with which you can take cover. It’s easy to get killed in these arenas because The Devil’s Cartel’s computer-controlled thugs are smart enough to take cover and flank you when you’re staying in one spot. Your own cover gets blasted away swiftly as well, so you have to stay on the move. One significant problem: The game isn’t particularly good at tracking where you want to take cover. 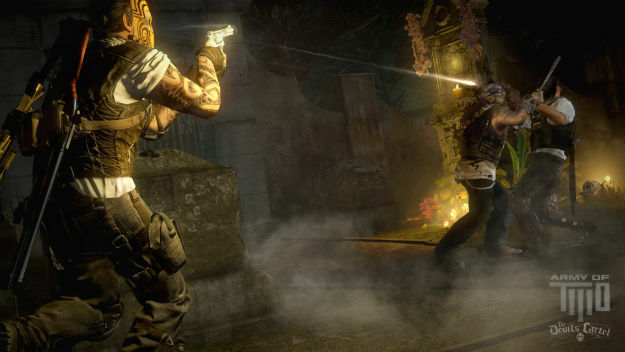 A stone gazebo in the center of one section could be used as a sniping tower by one character if the other gave them a boost up. Once the fight starts, the gazebo makes for a good cover spot on the ground, but pressing the button to take cover more often than not triggered the same animation for boosting up your partner, leaving you open to a hail of gunfire. With the game out on Mar. 26, technical problems like this are likely to stay in the final product. The second stretch of the demo was in some underground sewers, the mozzarella sticks of shooter settings. This stretch was somewhat confusing, not because of the architecture, but because of the dialogue. Merc Alpha continues to make fun of his partner Bravo for being afraid of graveyards and the dark. When coupled with the silly face masks—in addition to the panda, there’s also a Captain America-style mask and big smiley face that looks straight out of some high school stoner’s notebook margins—the light dialogue shows that this Army of Two has embraced the B-movie schlockiness that its predecessors stubbornly denied. It’s a half-hearted humor, though. It doesn’t commit to silliness, opting to be mostly quiet in order to get back to shooting stuff. Which is a shame—Were The Devil’s Cartel a parody, it might be on to something. As it is, it’s just junk food, a veritable bloomin’ onion in Electronic Arts’ spring line up. The exploding limbs shot off enemies are offensive, sure, but the play itself is functional enough. 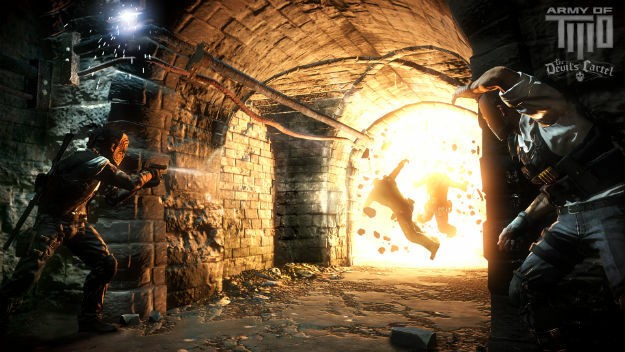 After this demo, would I intentionally go out, buy Army of Two: The Devil’s Cartel, then spend time playing it? No. If I were in the mood to play a shooter and it just happened to be nearby, sure, I’d play it. Why not. It’s right there.